There is something about zombie novels that is such a simple, easy read for me. Even though authors spend all this time creating complex worlds where the dead come to life, I just get right into them. It's almost like a palate cleanser for me. However Conversion is different. What a world to live in. Hot, dry, desolate and zombies. Damn. What a scary mix, honestly. A flu wiped up the planet and there were only a few left, struggling to eke out an existence and survive. Some were inside walls and some lived outside, doing whatever they could to survive or find their place on the food chain. It was a very "Mad Max: Thunder Dome" feel mixed with "I am Legend". All the different views and characters were complex but what I really enjoyed was that the jacks and jills had their own complex characteristics. The author explained the jacks and jills own insight and how they lived. They reminded me, actually, of the creatures in I am Legend. The pale, favouring dark places and stayed in packs with an alpha to lead them. They hunted at night. Each alpha had their own personality as well, and they seemed to recall their past as well. It was really fascinating. I enjoyed the wallcom situations and the strategy of the teams, and the bad guy was clearly absolutely certifiably insane. Near the end, I was actually wondering if the people who this person talked to were real or if they were part of the person's psyche fragmenting from all the horrors of the world. I definitely recommend this book for all the horror fanatics out there! S.T. Campitelli is a first-time author, The Fall his first book. He hasn’t won any awards and he isn’t a best-selling author… yet. He is an educationalist by profession and has continuing addictions to both movies and reading with a clear bent towards the post-apocalyptic, Scandinavian crime, and historical fiction and non-fiction. 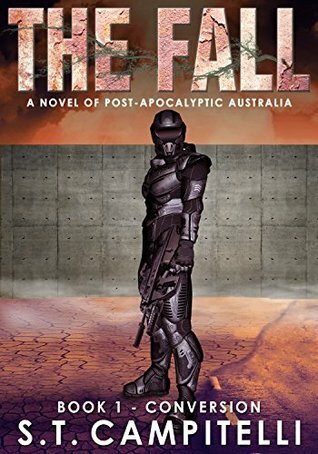 He lives in Melbourne, Australia, with his family, and he is neither waiting nor prepared for the impending Apocalypse.